President Obama delivers his 2012 State of The Union address outlining what he called a “Blueprint for An America Built To Last“. He called for both parties to work together to help America succeed. 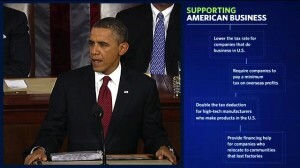 President Obama speaks on the status of efforts to find a balanced approach to deficit reduction. VIDEO: Obama's SOTU Comeback Line — "I Know 'Cause I Won Both Of 'Em"